Coconut oil for skin has many anti aging and nourishing benefits. Coconut oil for skin has many anti aging and nourishing beauty benefits. It is an excellent aid in helping to remove the outer layers of dead cells. Exfoliation leaves your complexion more even toned and smoother. Due to its small molecular structure coconut oil is able to penetrate deep to speed up cell renewal and increase the turnover of collagen. As cellular renewal takes place new fresh cells are brought to the surface to give a younger, dewy appearance to your complexion. With high antioxidant content it has the ability to prevent and protect against the formation of free radicals and other environmental aging factors. As we age, free-radical attack can speed up aging and cause your skin’s connective tissues to break down. When natural elasticity and strength is lost it allows wrinkles and sagging to set in. 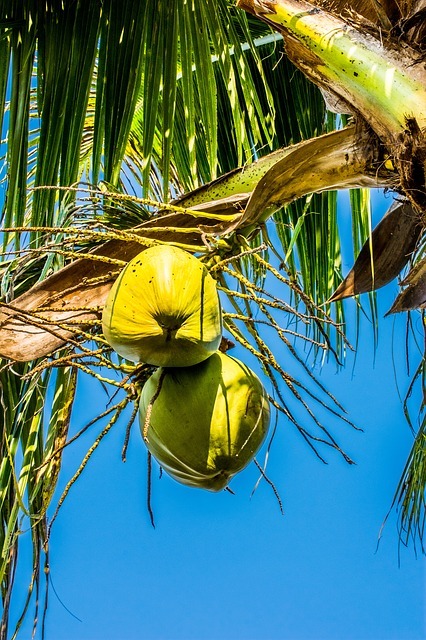 Let us take a look at the benefits of coconut oil for skin. Coconut oil has antibacterial properties that help prevent the infections that cause acne. This makes coconut oil an effective treatment against acne. It will help draw out impurities and clear up pores. It can also be used as a wonderful natural treatment to help fight off dermatitis, eczema, psoriasis and countless other skin ailments. Using coconut oil as a moisturizer is a very affordable and a natural way to add moisture where needed and keep skin supple. It absorbs easily into the skin and helps provide all day hydration. The antioxidant-rich oil will protect the skin from free radicals and help prevent aging liver spots and other blemishes. It is very useful to relieve dry, rough, mature skin. This amazing oil makes a great after-bath body moisturizer due to the abundance of Lauric Acid, and Vitamin E content to hydrate and nourish your entire body. This treatment is very easy to use right after the shower while your skin is damp. Coconut oil can be combined with other ingredients for facial masks or body treatments. This easy facial mask is excellent for an acne treatment. Mash the avocado in bowl. Combine all ingredients together. Apply to face, neck and décolleté. Leave on for 40 minutes. Rinse well with warm water. Pat dry and apply small amount of coconut oil as moisturizer. Mix together and apply mask to your face, neck and décolleté. Relax for 25 minutes. Rinse, pat dry and moisturize. *Look for organic virgin coconut oil. The highest quality products are best in their untouched forms. Highly processed products that have been refined, bleached and deodorized will not give you the best benefits. Shopping through Amazons secure server is easy. Just make your selection by clicking on the images below. Thanks for your support.